Readers, I've been a bit MIA in the past few weeks. A lot's been going on - I had some big projects to finish up at work, and I moved to a new apartment for the third time in the past two years. All that, in addition to friends visiting has left me with no time to blog! 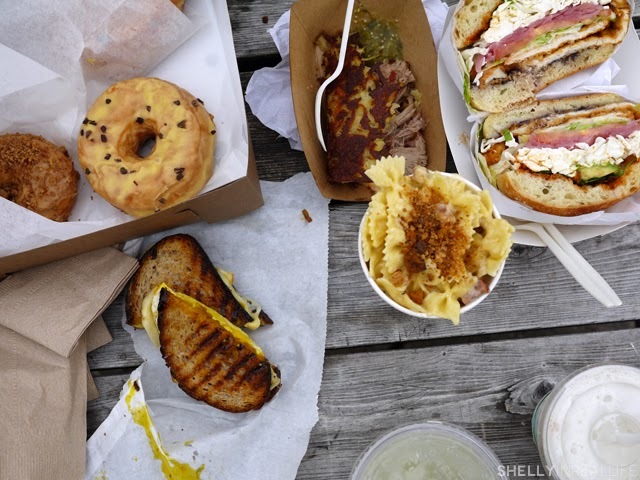 What do you get when you have a smörgåsbord of food from 75+ vendors, gathered in Williamsburg? 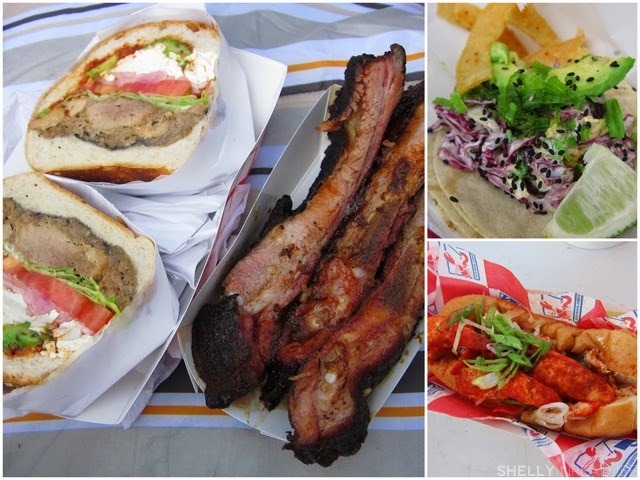 You get a Smorgasburg! 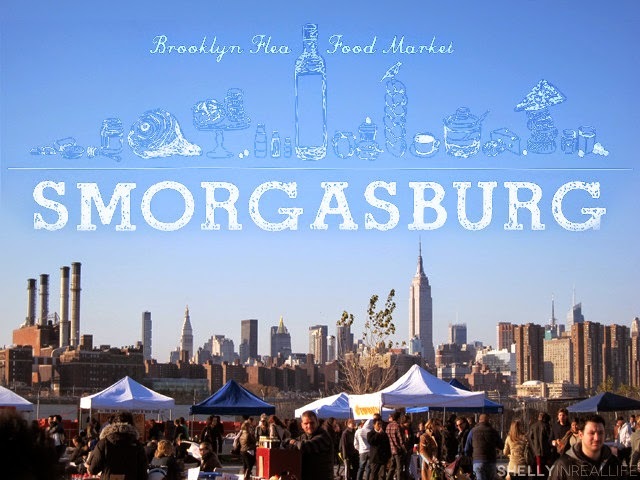 Get it, Smörgåsbord + Williamsburg = Smorgasburg - Cute, right? The Smorgasburg is one of my favorite summertime activities. It's available every Saturday in Williamsburg and most recently in 2013, they opened a new Sunday location in DUMBO since it's been so popular. I've had friends visit the new location and tell me that Williamsburg is still the better Smorg to go to. The Smorg begins every year around May and lasts through the end of October and is open "rain or shine". I say rain or shine in quotes because during my first year here, there happened to be a freak snowstorm over Halloween weekend. It was only snowing a little when J and I made the trek over to Williamsburg for one of the last weekends of Smorgasbord, but alas, there were no vendors there. What can I say? We're serious about our food! I brought one of my latest visitor here since it's only a short L train ride away from the city with tons of delicious New York eats all in one spot. Not to mention a beautiful view of Manhattan to boot. We went with a mission: to try as many noms as we could. We divided and conquered, with each of us going to different vendors and meeting back up at the picnic tables. The spread above includes some of my favorites, four doughnuts from Dough (mojito is amazing) and a breakfast grilled cheese from Milk Truck . Pro-tip: Make sure you grab some doughnuts from Dough before they sell out - because they do sell out. I have to admit, some of the food stalls are hit or misses, so it's good to do a bit of research if you're picky (like me). Here's a complete list of the vendors, although keep in mind they aren't there every week. Next up is one that just recently became a favorite - goodies from the Milk Truck. HIGHLY RECOMMENDED! 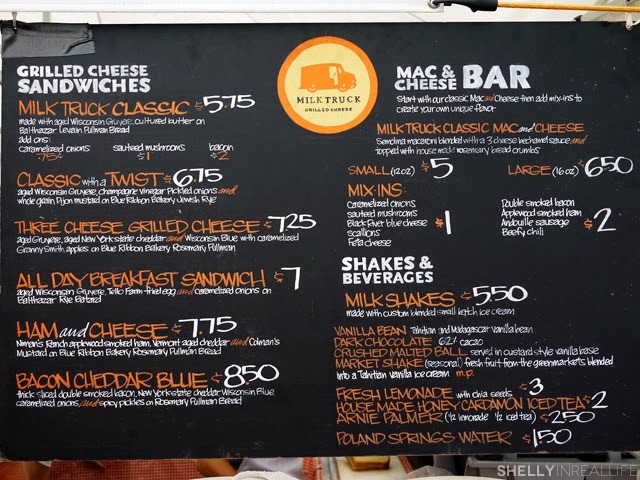 The Milk Truck serves, hands down, one of the best grilled cheese sandwiches I've ever had, and also a vanilla bean milkshake that tastes like it came from heaven. Trust me, I don't normally have much of a sweet tooth, but I can seriously drink a million of these shakes. 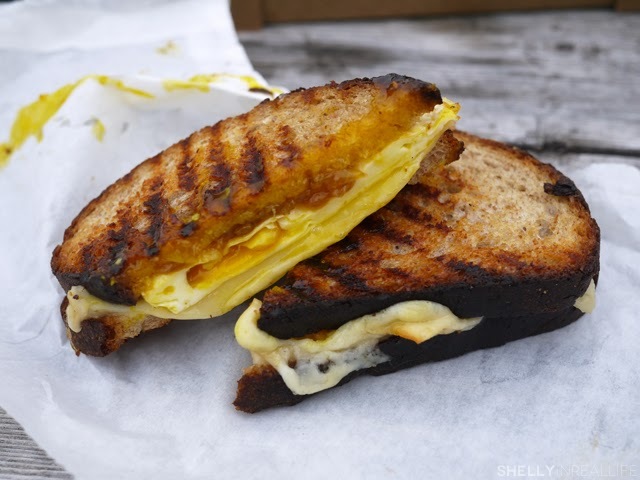 We ended up getting the All Day Breakfast Sandwich made with Aged Wisconsin Gruyere, Tello Farm Fried Egg and caramelized onions on Balthazar Rye Batard. How can that NOT taste amazing? We also ordered the mac & cheese with andouille sausage. I found less impressive, so I say skip that and get another sandwich if you really wanted to. Next up, is something I've found myself really craving lately. 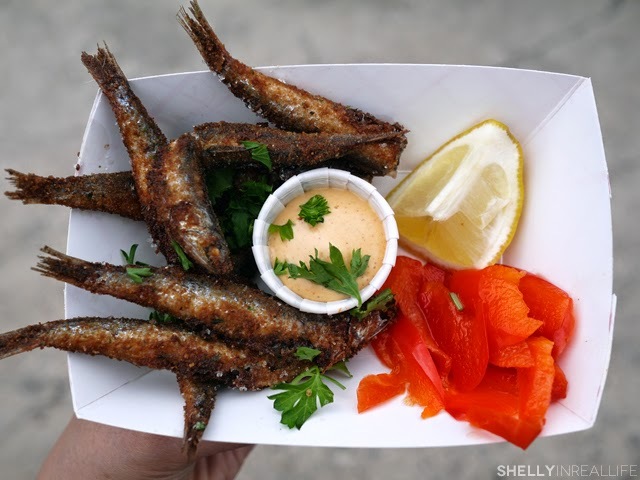 These awesome fried anchovies, Jersey-style w/heads on from Bon Chovie. These lightly battered anchovies are deeped fried to order and super fresh and hot for your enjoyment. I love the slight crunch and saltiness along with the mayo it comes with (which could use more heat if you ask me). It gets to be a bit much after 2-3 anchovies, so I'll say you definitely need to split Bon Chovies with friends. 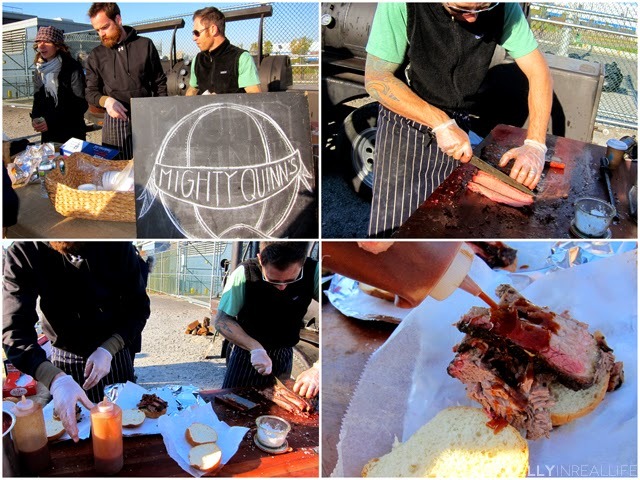 Another favorite is Mighty Quinn's Slow Smoked BBQ. They park their smoker right in the lot and they serve as the meat smokes behind them. The lines for this is typically quite long, expect to line up at least 30 minutes fore this, so hop in the line with some food in hand! 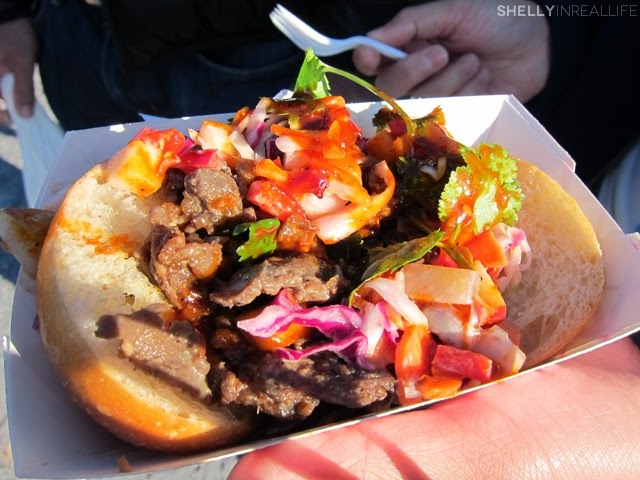 The brisket sandwich is awesome with tender meat, smokey sauce and pickled veggies! Along with the sandwich, we picked up smoked spare ribs, which I liked more than the sandwich, but I'm just really not a sandwich person. Overall, it was great. 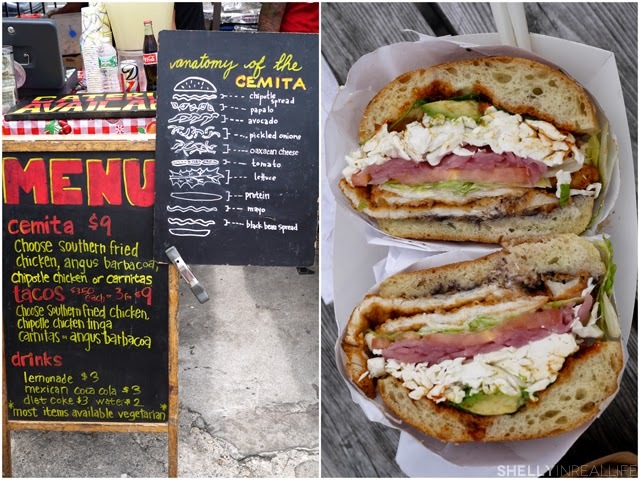 Other vendors to check out at Smorgasburg include Takumi Taco - Japanese inspired tacos, my fave is the Rock Shrimp Tempura Taco - and Red Hook Lobster Pound's lobster rolls which speaks for itself with its huge chunks of lobster and toasted sandwich buns. 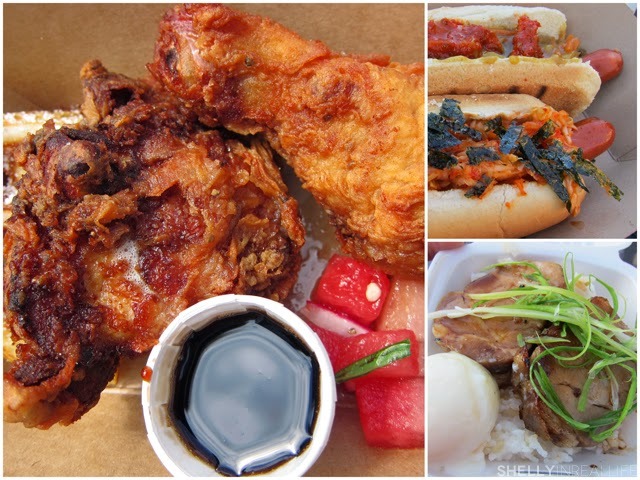 If you're familiar with food trucks & vendors around Manhattan, then you will know Asia Dog, which are hot dogs with Asian topics. 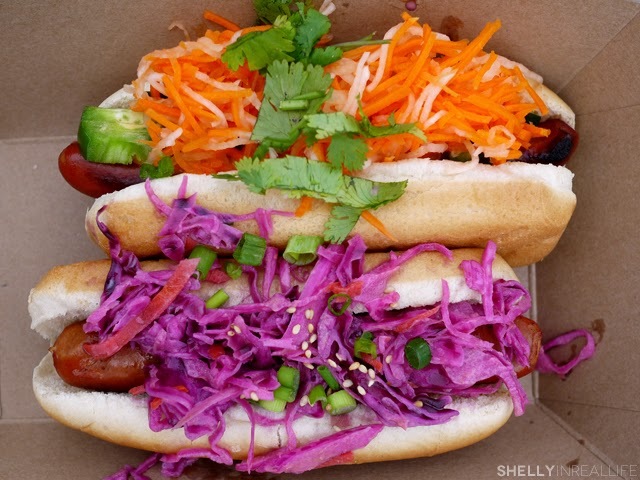 Below you have the Banh Mi Dog and Mel & Steve Dog... worth a try if you haven't had it before! Finally, we can end this post with some fried chicken and waffles from the good folks at Buttermilk Channel (BFC) with a watermelon salad with a hint of basil. Amazed that they can make fried chicken that good from a food stand! Was that food overload for you? I'm telling you, it's great to come with a ton of friends who love to share! A wonderful way to spend your Saturday, especially if the weather is nice out. 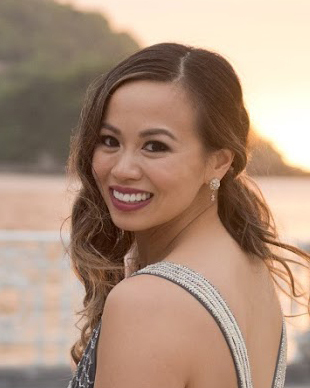 Make sure you come with a strategy, that everyone spreads out and grabs 1-2 plates of food and to reconvene at the picnic tables to give it a try!